Your 21st birthday. It’s a milestone in every life. You are finally recognised as a full adult with only an interest-only mortgage, dinner table discussions about cash ISA’s and the inevitable trips to IKEA to look forward to. What better way to welcome this defining time than by annihilating real life (well dead) zombies in a variety of thrilling locations. We have a slew of amazing zombie battling adventures dotted around the UK and ideal for solo, rights of passage type affairs, or mass, all-your-mates-going-berserk-with-paintball-guns based mayhem. It’s a completely unique way to mark a birthday and we can guarantee it’s completely unforgettable. Also check out or zombie experience days website! Every zombie film ever made features a living dead infested visit to a shopping mall for some reason. It’s inevitable. That may explain why our Zombie Shopping Mall experience in Reading is so darn popular. Participants and press crews have descended from all over the world to subject themselves to this exhilarating, fevered adventure, where you stalk the concourses and stairwells of an abandoned shopping centre, searching for your zombie prey. Fancy a trip to the Smoke but don’t fancy a traditional trip to the West End or that Nando’s in Piccadilly Circus? Why not wage war on the living dead in a decommissioned nuclear bunker somewhere in South East London. 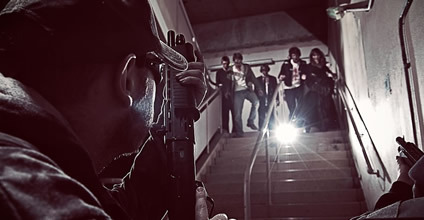 Our London Zombie Battle is the first of its kind in the capital, with live-action zombies attempting to derail you from your mission to eliminate them as effectively as possible. And the TOWIE gang even made a visit and everyone loves them! 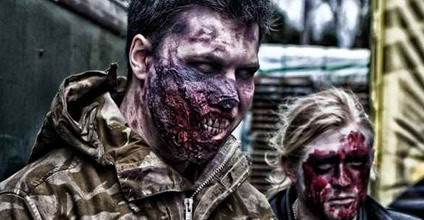 The original zombie experience takes place in the Midlands, where you can face the horrors of Zombie Boot Camp. Great for group activity, monstrous types have taken over an undisclosed area. You are your squadron will be trained by military experts and sent out to finish them off. Plus, for that added fear factor, you can Try Zombie Boot Camp: After Dark, which we can promise you, is not for the faint of heart.